Carl Adolph Agardh was a Swedish botanist and bishop of Karlstad. He was known for his extensive work on algae. Agardh was born on 23 January 1785 in Båstad, a town in Scania (Swedish: Skåne), Sweden. He began to study at Lund University in 1799. In 1807, Agardh became a teacher of mathematics at Lund. In 1812, he was appointed professor of botany and rural economy. He was elected a member of the Royal Swedish Academy of Sciences in 1817, and of the Swedish Academy in 1831. Agardh became a Lutheran clergyman in 1816. He was a member of the Swedish Parliament on several occasions from 1817. He was rector magnificus of Lund University from 1819 to 1820. 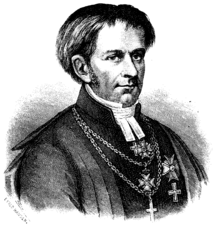 In 1835 he became the bishop of Karlstad, where he remained until his death. He died on 28 January 1859 in Karlstad. This author is usually abbreviated C.Agardh when citing a botanical name. Agardh was the father of Jacob Georg Agardh, also a botanist. ↑ "Agardh". Imago Mundi - Encyclopédie gratuite en ligne (in French). Retrieved 5 June 2013. ↑ 2.0 2.1 2.2 "Agardh, Karl Adolf". The new international encyclopaedia (archive). 2005. p. 191. Retrieved 5 June 2013. ↑ Eriksson, Gunnar (1970). "Agardh, Carl Adolph". Dictionary of Scientific Biography. 1. New York: Charles Scribner's Sons. pp. 69–70. ISBN 0-684-10114-9. ↑ "Karl Adolph Agardh". New International Encyclopedia. 1905. ↑ Brummitt, R. K.; C. E. Powell (1992). Authors of Plant Names. Royal Botanic Gardens, Kew. ISBN 1-84246-085-4. Wikimedia Commons has media related to Carl Adolph Agardh. Wikispecies has information on: Carl Adolph Agardh. This page was last changed on 15 September 2018, at 20:42.